After delivering more than 5,000 pounds of cargo, fuel and oxygen, a European automated resupply freighter undocked from the International Space Station on Monday and headed for a destructive plunge back into the atmosphere. The Automated Transfer Vehicle, christened Johannes Kepler after the German astronomer and mathematician, separated from the complex at 1446 GMT (10:46 a.m. EDT). One minute later, after backing away from the station's Zvezda service module, the ATV fired thrusters to accelerate its departure. The ship is carrying more than 2,600 pounds of trash for the re-entry. Almost all the spacecraft will burn up in the atmosphere, but the hardiest components could survive to impact the Pacific Ocean. Two engine burns are on tap Tuesday to lower the craft's orbit. The ATV will dive back into the atmosphere at 2024 GMT (4:24 p.m. EDT) and its remnants will reach the surface about 2059 GMT (4:59 p.m. EDT), according to the European Space Agency. A data recorder strapped to the spacecraft will record the ATV's final moments, capturing information on temperatures, accelerations and tumble rates as the ship breaks apart in the atmosphere. Designed and built by the Aerospace Corp., the Re-entry Breakup Recorder, or REBR, is protected inside its own heat shield to survive the scorching environment. It will transmit the data via satellite back to engineers in the United States before hitting the ocean and sinking. Officials believe data collected by the REBR device will yield insights into how spacecraft end their lives during re-entry. A similar unit was stored inside a Japanese cargo freighter on its trip back into the atmosphere in March. The ATV's last duty before leaving the space station was boosting the lab's orbit by 35 kilometers, or about 22 miles. The spacecraft fired its thrusters over three days between June 12 and June 17 to raise the station's orbit. The complex is now circling the planet at an average altitude of 237 miles, higher than the space station has ever flown before. The reboosts were conceived to place the lab higher above the drag effects of Earth's atmosphere. Although the atmosphere at the station's orbit is almost non-existent, there is enough air resistance to gradually slow the lab's velocity and cause it to drop altitude. After the reboosts, engineers say the station will need fewer correction maneuveers to maintain its orbit, so future cargo vehicles could deliver more experiments and spare parts instead of refueling propellant. The space station flew at a lower altitude during construction to allow visiting space shuttles to deliver more gear and heavier modules to the outpost. With the shuttle's retirement looming, there's no longer a need to keep the station's orbit lower. 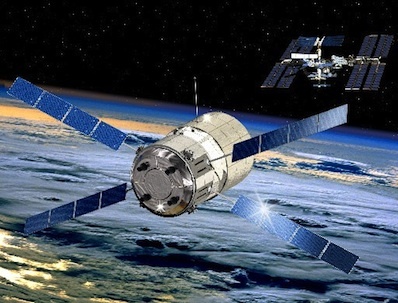 The higher orbit will cut the station's annual fuel usage nearly in half, according to ESA. The Johannes Kepler spacecraft launched Feb. 16 and reached the space station Feb. 24. It stayed docked to the lab for 116 days. Built by EADS Astrium, the ATV measures 32 feet long and nearly 15 feet wide. Its four solar array wings stretch more than 70 feet across. Four main engines and 20 smaller thrusters guide spacecraft in orbit. The Johannes Kepler mission, the ATV's second flight, hauled about 3,500 pounds of dry cargo in its pressurized cabin. Astronauts manually unloaded that equipment during the craft's stay. The spacecraft also carried refueling propellant and oxygen to replenish the station's tanks.